How weaponize became a political, cultural, and internet term du jour. Everything Is Weaponized Now. This Is a Good Sign for Peace. 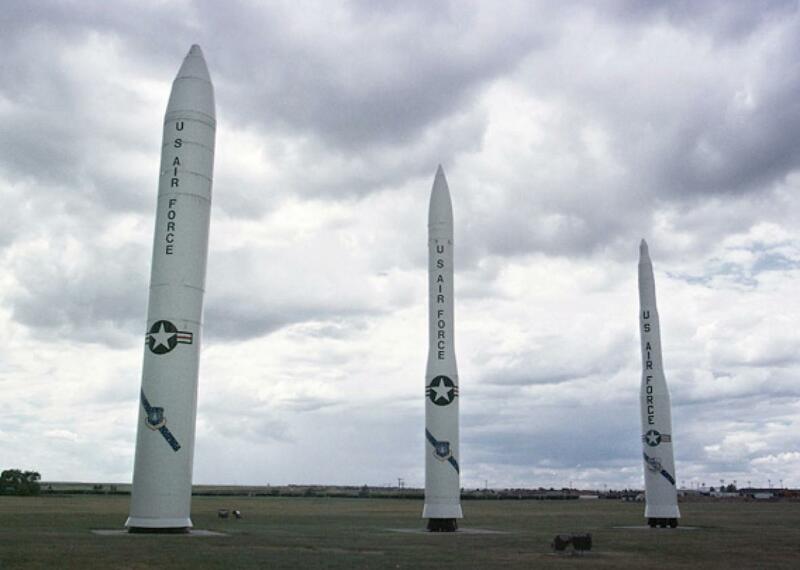 Peacekeeper missile and two versions of the Minuteman missile at Warren Air Force base. In the 1950s, we weaponized uranium to make nuclear warheads. Today, we weaponize safe spaces at campus protests. What happened? The history of this word weaponize reveals the shifting anxieties of the past half-century. But in this violent metaphor, which has been bombarding our public discourse of late, there is actually something much more peaceful afoot. Nuclear weaponizing persisted through the arms races, missile crises, and fears of mutually assured destruction of the 1950s and 1960s. Since then, weaponize has expanded into new frontiers. In the late 1960s and 1970s, we see biological and chemical agents weaponized thanks to the Vietnam War. The Strategic Defense Initiative, or Star Wars, weighed weaponizing space in the 1980s. During the 1990s, the geopolitical focus turned from Russia to the Middle East and Asia over concerns of growing weaponization there. After the post-9/11 anthrax attacks thrust weaponize back into the spotlight, the word has since geared up on two new fronts: drones and cyberwarfare. Now, some fear future weaponization in viruses, DNA, insects, robots, geoengineering, and even marijuana. But it’s outside of military contexts that weaponize has really proliferated in the last decade. We’ve weaponized: women, architecture, black suffering, anthropology, the facts, texting, femininity, marketing, secularism, religion, ideology, traditional forms of dress, virtue, sadness, social constructions, iWatches, and fictional experiences in video games. The word, of course, has enjoyed glibber applications: Writers have weaponized everything from flatulence to kale salads. This website appears, to some, to weaponize the narcissism of small differences. The 2016 presidential election has been a hotbed for weaponization. There’s the weaponization of Jeb Bush’s campaign fundraising, online harassment from Bernie Bros, and grief at the Republican National Convention. Donald Trump has weaponized the issue of trade. Putin has weaponized WikiLeaks against the Clinton operation. On The Diane Rehm Show, psychologist William Doherty cautioned against “weaponizing diagnoses” of mental illness against Donald Trump. And on The Run-Up podcast, conservative radio show host Charlie Sykes lamented how an “alternative reality has been weaponized” by the alt-right media. This weaponization has transformed just about every political act “into a powerful means of gaining advantage,” as Chuck McCutcheon and David Mark argue in their election glossary, Doubletalk. So, is weaponize just a metaphor du jour? We do like to broaden our words over time; take our nonetymological usages of decimate and awesome, perennial gripes of prescriptivists. Or are we under the spell of a linguistic recency illusion? When we notice a word in one place, we indeed find it frequenting many others. Have professors just cribbed from sergeants, appropriating weaponize to shorthand their theories of hegemony? Many usages of weaponize do come from the mouths and pens of experts, and a new-fangled Twitter account even mocks the overused weaponized X in academese. All of these factors surely have some influence on the spread of this aging word, but the massive and growing stockpile of weaponize still suggests it’s more than just a buzzword. Examples of weaponize in the Atlantic, which has deployed it against a range of targets, are particularly instructive. In a 2012 article, Whitney Phillips examined how internet trolls “weaponize existing tropes and cultural sensitivities.” In 2015, Megan Garber called out the casual misogyny underlying the “weaponized charm” of the romantic comedy Hitch. Weaponize made it into the headline, and thesis, of a November 2015 piece by Conor Friedersdorf: “It’s as if they’ve weaponized the concept of ‘safe space’,” he wrote of the 2015–16 University of Missouri protesters who, in duly exercising and fighting for civil liberties, stymied some of those selfsame rights for journalists. In these Atlantic examples, we can observe contradictory forces of weaponize at work. On the one hand, everything is a weapon. We are attacking each other online with memes, in popular culture with sexist subtexts, on university campuses with safe spaces. On the other hand, nothing is an actual weapon. Nuclear warheads and chemical agents are the preoccupations of a bygone era. We don’t have trenches or gladiatorial arenas anymore; we have comments sections. How are we to disarm the paradoxical force of weaponize? We should first put weaponize in broader context. The word is on the linguistic battlefront of a larger cultural fight—a fight that’s easy to forget as we retreat to the political corners and sound off in the echo chambers of our digitally fragmented, ideologically segregated lives. We can see this fight waged between #BlackLivesMatter and #AllLivesMatter, between transgender bathroom access and “Back in my day, boys were boys.” We see it between banning Native American headgear in Yale Halloween costumes and Donald Trump’s epithet of “Pocahontas” for Elizabethan Warren. Brawling out on the turf of America’s changing demography and economy, weaponize is at the center of this fight between microaggressions and dog whistles, between trigger warnings and P.C. backlash, between the collective sacrifices required of pluralism and the conservatism of privilege, where nuance, complexity, and civil engagement are getting kicked in the ribs. As one tweeter epitomizes the conflict with painful irony: “‘The word “racist” was created SPECIFICALLY to trigger shame & guilt in WHITE people. It is a weaponized word.” Yes, we’ve weaponized weaponize. This larger conflict can seem like the weaponization of a societal mass destruction. An unprecedented political campaign, police shootings, climatological devastation, terrorist attacks: 2016 has felt like the worst year, the most violent year ever. Yet, counterintuitively, the world is in reality becoming a less violent place. Terrorist attacks are an unqualified horror, but just 100 years ago, the Battle of the Somme alone claimed more than 1 million lives. We once tolerated bullying as a fact of childhood life; now it’s getting its due as a major focus of policy. And in the public discourse, we aren’t talking about weaponizing nuclear warheads. We are talking about weaponizing safe spaces. The spread of weaponize is a mass destruction of literal weaponization. When metaphors become more violent, as with weaponize, it may just mean our world is becoming less so.